Then, you will land on the WordPress installation page. You will choose either https or HTTP for this one. Note that you will be unable to install your website on an HTTPS if there is no SSL certificate installed first. Choose the domain that will be used to access the website. Those fields will be copied to the wordpress website during the installation process. 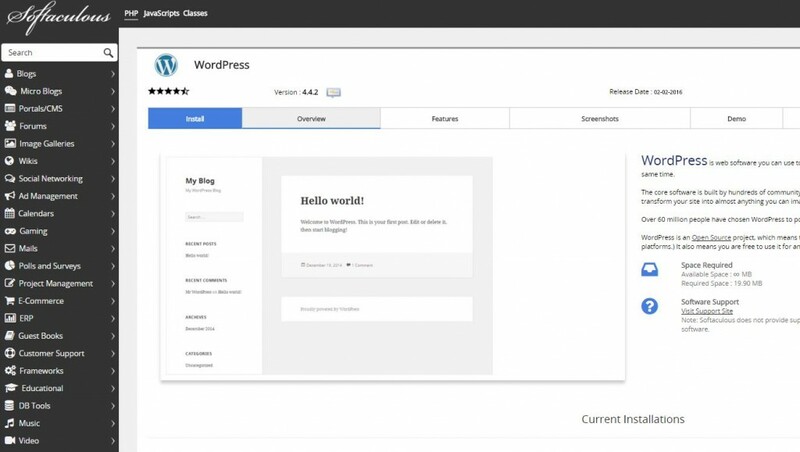 You can install WordPress in another language: French, German, Spanish, Chinese and many more. After this change, the WordPress administration area wil be in the selected language. This plugin (loginizer) is important nowadays. It limits login attempts at your wordpress administration login page. If you lock you out, you can go to the file manager, to the plugins folder and rename the plugin to deactivate it. It is perfect to protect your website against bruteforce attacks and people who try to guess your password. It allows you to install wordpress on a remote mysql database. It also allows you to auto update the wordpress version, the plugins version & the themes automatically. We didn’t notice any problems with wordpress version upgrades. updating the plugins automatically is a sensitive task. Most of the time, on WordPress installations, problems are related to the plugins. It is better to manually update plugins and check that the website is working well. If you have modify your theme, your changes will be deleted during update. That’s why i recommend to activate this option only if you have created a Child theme. You can also activate the auto-backup option from here. Note that the Cpanel backup isn’t automated. Choose a theme for your wordpress installation. It is not mandatory. After installation, you will be able to choose a theme from the wordpress repository.